Definitely a new kind of "fairy" tale--quite literally! Knife, by R. J. Anderson is the first installment in a three-part series about a race of faeries that make their home in a monstrous oak tree, and the way their lives intermingle with the human society around them. The young faery in this tale is a fierce, independent soul with an unquenchable thirst for adventure. She goes by several different names in the story, but Knife is the name that she holds most dear. 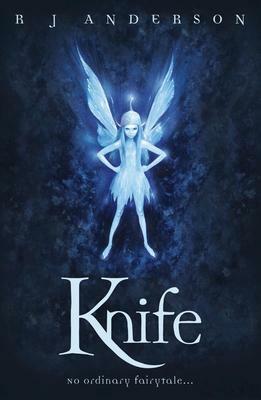 As the youngest faery in the Oakenwyld, the area of the humans' backyard the Oakenfolk call their home, Knife is at the mercy of every other faery in her home. Bargaining is the only way to make anything happen in this culture, and she must bargain the worst of the chores around the Oak for anything and everything she needs or wants. When the Queen calls her to ceremony to receive her lifelong task or career, she's completely surprised--and eventually delighted--to be named Queen's Hunter. The Queen's Hunter is one of the only faeries allowed outside of the Oak, and Knife has always dreamed to fly free in the open air ever since she was small. But with her position comes a great deal of responsibility and danger, and it takes everything Knife is to keep herself and the dwindling population of her fellow Oakenfolk alive. R. J. Anderson weaves an exciting and mysterious story--her characters struggle with their reality as they unravel the past they thought they knew and discover secrets that were perhaps best left hidden away. Knife must learn how to fend for herself, how to fight for herself, and then she must learn how to let down her guard and trust, time and time again, which is no easy task for someone so independent. Anderson does a fine job of defining and intertwining cultures, individuals, and life experiences. She writes with a lyrical prose, and the grace and compassion of a woman wise beyond her years. I wouldn't be surprised if I snatched up anything and everything she ever wrote, from now until the end of time. For more information on Knife by R. J. Anderson, visit our website here. There is a note of heaviness to this book. The Gospel of Trees is a memoir written by a woman named Apricot Iriving, eldest daughter of missionary parents to Haiti. She weaves heartbreak through the story of how she grew up, moved to Haiti and back, and back and away again. She falls in and out of love with the home of her childhood, the prison of her teenage years; the best and worst things that could have happened to her when her parents decided to upend her world. There's an overall tone of hopelessness to this story, and yet by reading it, I feel as though I have been freed of questions and anguishes that have plagued me since I donned the mantle of missionary kid when I was seven years old. How do we respond in the face of such blatant, crushing, impossible poverty? How do we respond to our own privilege? Am I lording my white privilege over the other races of the world? Have I grown up believing I was better because I was born into more money? And whether stated, or implied on purpose or by accident, I think something that Apricot Irving's memoir stresses is that richness cannot be measured only by money. There is so much more to the world than material wealth. The Gospel of Trees is, in a sense, an exploration or what happens when people who want to help try to force themselves on another culture, assuming that they know better when they know nothing about the culture they are "educating" in the first place. This is a major, gigantic, dangerous flaw in the realm of Western Christian mission that can and should be addressed. So often, well-meaning people enter a world in which they don't speak the language, they don't know the customs, they don't agree with the religion, and they desperately want to help. Why do we assume that we can help in the first place, and that our form of helping won't do more harm than good? It is possible to damage with our good intentions. It is hugely possible to do great harm under the banner of selflessness and altruism. It is possible for men and women to do evil in the name of Christ, whether they intend for it or not. The Gospel of Trees is an illustration of good intentions gone wrong, and the entitled help of privileged people ravaging a country already riddled with suffering. Are we entering the places and situations we live in with humility? With questions? Are we leaving our assumptions and pride at the door to make sure we're not accidentally harming someone by bringing in a good system that, plainly, will not work in the situation we're in? "I offered [her] the benediction that an irreverent and holy vicar in London had given me: Forgive yourself. Forgive others. Go in peace. Forgive yourself, forgive others, and go in peace. That is what I would like to learn to do. For more information on The Gospel of Trees by Apricot Irving, visit our website here. I'm going to be honest for a moment. I have a hard time finding Christian fiction that I really, really enjoy, let alone Christian historical fiction. I find a lot of it to be cheesy and predictable and a little... boring. I'm very picky. It's been a long time (which is sad) since I found a book from this genre that beautifully describes a certain era, and builds character development that's believable. And that's not all about a love story. I love a good love story as much as the next girl, but sometimes I really want to read a book that doesn't revolve around it, or it's not the main focus. I must say, Jocelyn Green has been a breath of fresh air. A Refuge Assured takes place just as the French Revolution begins in 1792, when lacemaker Vivienne Rivard learns that her occupation will likely get her killed by the guillotine like it killed her dear aunt. When her last remaining relative, her mother, dies from a terrible fever, Vivienne escapes France and travels to the United States to the capital, Philadelphia. But she soon finds out that danger lurks in the French Quarter as Revolutionary sympathizers begin to suspect a young boy left in her care might be the Dauphin. Militiaman Liam Delaney proudly served in the American Revolution, but now that the new government has placed an oppressive tax on whiskey that impacts his family, he barely recognizes and questions the new democracy that he fought so hard for. He then meets Vivienne and they are drawn together in surprising ways to fight for the peace and safety they both long for. I enjoyed this book immensely. The story flowed with a nice pace that didn't feel like the author was trying to fit too much into the 400 pages, but wasn't so slow as to be boring. Overall, a very well written story that reminds us that, no matter where we are and what our situation is, our refuge is in Christ. All we need to do is trust in him. For more information on A Refuge Assured by Jocelyn Green, visit our website here. Reclaiming Shilo Snow is book #2 following The Evaporation of Sofi Snow--another fantastic read from Mary Weber. In this high-stakes, action-packed sequel, Sofi Snow must conquer her fears, her love, her hatred--even her very own mind--in order to make it off of the alien planet of Delon alive. After finding out that her brother was abducted by the alien race masquerading as allies to earth's many celebrated ambassadors, Reclaiming Shilo Snow begins where the first book left off: Sofi and Miguel are sneaking through the technologically-advanced corridors of the planet where the alien race of Delonese make their home. Sofi is sure that they have her brother held captive somewhere, just like they were holding dozens of other children over the years, using them as lab-rats in an attempt to rebuild their population. Despite the massive leaps in medical technology they've provided, the trafficking and experimentation the Delonese are subjecting upon earth's people comes as a horrid shock. Sofi's journey to reclaim her brother from their grasp turns into a much bigger problem--one that will have far-reaching consequences ranging all across the earth, if earth survives. Mary Weber intertwines science-fiction with the horrid reality of human trafficking and the underground black-market that is so easy to put out of our minds today. The story shifts between Sofi and Miguel's perspectives--two teenagers fighting for their lives and the lives of everyone across the globe, whether they realize it or not. They are the silent forces, ushering safety and peace into the dark corners of the world where parents aren't equipped to protect their children, and the market for evil reaches further and grows bigger than anyone realizes. Between the cracks, Weber develops characters with compassion for the lost and broken, and compassion for those that have hurt us in the most painful way. She presents characters who could easily be seen as fully evil in a way that appreciates that there are two sides to every story. She doesn't ignore the complexity and nuance of each individual life. Weber conveys emotion with alarming accuracy through the eyes of two teenage characters, and her two-part series following the Snow siblings carries an important message to the darkness of today. For more information on Reclaiming Shilo Snow by Mary Weber, visit our website here.